Legend has it that on 31 October 1517, a German friar named Martin Luther (1483–1546) nailed a statement of criticism of the Roman Catholic Church on the doors of Wittenberg church. It is not known for sure whether he really nailed his protest to the doors or sent it directly to the local Archbishop. But one thing is certain: his ‘95 theses’ shook Europe to the core and led to a great cultural revolution. It encouraged the German Peasants’ Revolt of 1524–25, in which the rural poor raised an army of 300,000 to fight the feudal order, and later still the Thirty Years’ War (1618–48). Both resulted in appalling death tolls and widespread destruction of Church property and artworks. A third of the peasant army was massacred and during the Thirty Years’ War the modern equivalent of 40 million people died. Luther’s ideas, and those of the Reformation, did not just fall out of the sky. There had been earlier critics of the Church’s corruption. However, Luther’s protest occurred at a time when the feudal system in Germany was unravelling. Not only were the plebians fed up with exploitation and taxes but towns and cities were developing with a class of merchants and industrialists being held back by the old feudal order. Luther was also supported by some among the aristocracy – the secular princes – who were more than happy to confiscate and seize Church property in the name of a higher principle. The Church owned a third of the land. 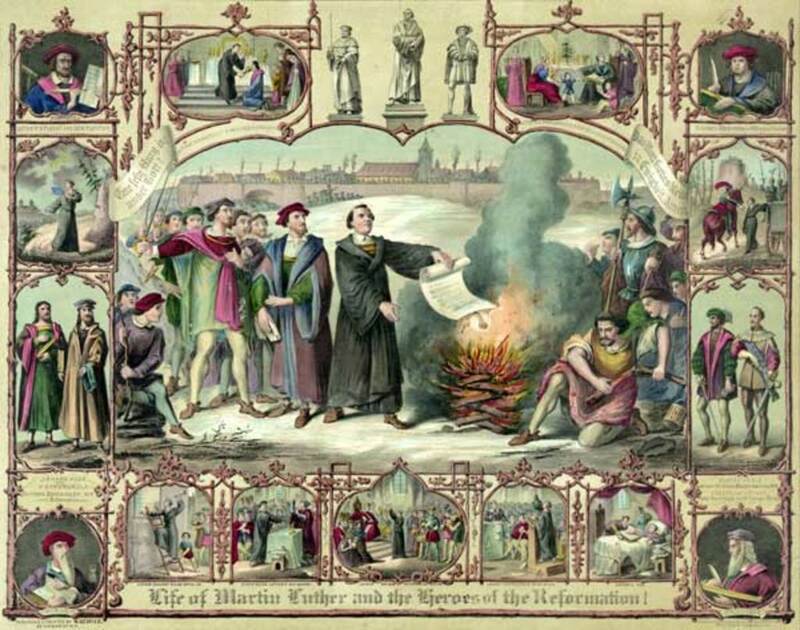 Luther’s dissent was able to gain much ground thanks to the Gutenberg printing press, technology that allowed for books, pamphlets, posters and cartoons to be printed in large numbers. Not everyone could read but there were gatherings at which the latest subversive works would be read to those assembled and, within a decade, half of Germany was ‘Lutheran’. As with other events that turned the world upside down, such as the English barons’ revolt and the struggle for Magna Carta in the thirteenth century, Luther had no idea what he was unleashing. He thought he was just provoking a debate over issues that outraged him, such as the Church’s practice of selling Indulgences to raise money for the rebuilding of St Peter’s Basilica in Rome. An Indulgence was a certificate issued by the Church and sold by priests with a guarantee that it would ensure passage to Heaven. They were very costly at about half a year’s wage. Perhaps Luther’s most subversive and radical idea was his belief that the Bible, not priests and popes, was the central religious authority. Back then, Bibles were in Latin – a language of the priests – and usually chained up in churches. Luther’s translation of the Bible into the language of the people – vernacular German – had revolutionary implications. Essentially, Luther challenged and overturned the idea that the relationship between the individual and God requires the mediation of priests representing an institution headed by a theologically infallible source of divine authority, the Pope. Luther is best described as an ‘accidental revolutionary’, someone who opposed actual revolution. When the peasants took up arms against the Church and other landlords, he immediately opposed them and supported their suppression; for him, liberty was purely spiritual. It has been said that Luther liberated Germans from feudal Catholicism but bound them to state power. In asserting the individual nature of the relationship with God, and in translating the New Testament from Latin to German, he was creating the conditions for individuals to think for themselves and to doubt and criticize what had been ‘common sense’ for the previous thousand years. By all accounts, Luther was not a nice person. He was a fanatic, obsessed with guilt and sin. He constantly prayed, confessed, fasted and flagellated himself for long periods. By today’s standards, he was an extreme fundamentalist, and anti-Semitic to boot (as were many Catholics back then). What could such a person and his rebellion against the Catholic Church possibly have to do with democracy? Why is it that around the world millions will not just commemorate, but celebrate, his act of defiance of 500 years ago? I do not have space in this post for the complicated detail but, again, the essence of his challenge was that the connection to God was an individual one, that faith was what mattered, not actions such as rituals and Indulgences. From this perspective, every baptised person was a pope: ‘the priesthood of all believers’. Such insights laid a basis for progress toward democracy. The free Christian eventually became the free citizen – but only when philosophy caught up with and digested the still unfolding changes occurring on the ground, changes reflected by the displacement of religion in the C18th with the Enlightenment. 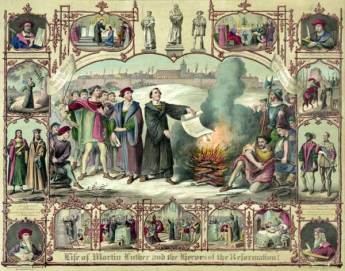 In a ‘papal bull’ issued in June 1520, Pope Leo X called for Luther’s works to be burned. Luther responded in December by publicly burning the bull. In January 1521, the Pope excommunicated him and Luther responded by calling the Pope ‘the Anti-Christ’. Christianity was split in two, and then further fragmented. When, nearly two centuries later, John Locke's ‘Letter concerning Toleration’ (1690) argued that the church was a voluntary association based on individual conscience, he was presenting a key Reformation idea that one's religious confession is a matter of individual choice rather than institutional imposition. Today, freedom of conscience owes much to the forces unleashed 500 years ago at Wittenberg. In fighting the tyranny of Rome, Europeans learned to fight tyranny of every kind. The ‘priesthood of all believers’ was a vital precondition for the much later secular democracy of all citizens.